Hypogeum literally means “underground” in Greek. The Hypogeum was probably used as a burial site (the remains of 7,000 individuals were discovered inside), and the site is located in the most unassuming neighborhood of Paola. When I say “unassuming,” I mean that you can walk right over the Hypogeum without ever knowing what lies beneath your feet. The Hypogeum dates back to at least 3,300 BCE. I say “at least,” because when going this far back into prehistory, dating is anything but certain. The site was discovered by accident in 1902 and excavations began in 1903. The site was excavated again in 1993 and preservation efforts are ongoing to preserve one of the only underground prehistoric temples in the world. A map of the hypogeum. Image © Wikimedia. The most widely accepted theory is that the Hypogeum was used as a burial chamber, but there is evidence that the site had other uses. The Hypogeum could have been used as a place of worship. This interpretation is supported by the presence of an “Oracle Chamber.” The Oracle Chamber is a niche in the wall, in which a person would stand, (with a deep voice in the 100-110mz range) and chant or hum. This sound would resonate throughout the chamber and possibly induce a trance or hypnotic state. There was a great video on this phenomenon, but it was removed from YouTube. You can learn more about the Oracle Chamber from watching the linked video here. 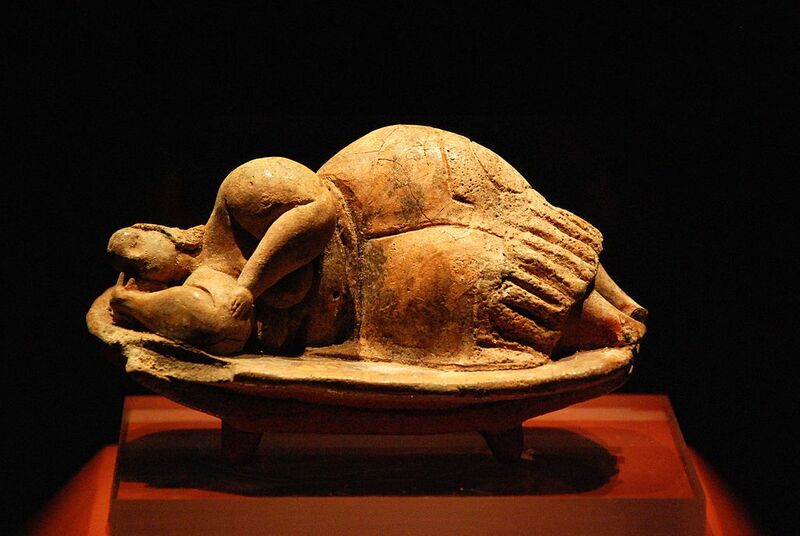 One of the greatest and most mysterious artifacts ever discovered in Malta, The Sleeping Lady, was discovered in the Hypogeum. No one knows exactly what she represents. Is she asleep? Dead? Resting? is she an offering to an unknown god or goddess? Does she represent some unknown aspect of Neolithic life in Malta? We may never know. All we can do is gaze upon her beauty at Malta’s National Museum of Archaeology and wonder. The Sleeping Lady. Image © Wikimedia. After you descend into the Hypogeum, you are surrounded by red spirals. They are on the ceiling, the walls, and most noticeably present in the Oracle Chamber. Just like most other aspects of the Hypogeum, these images are not fully understood. Were they made as symbols of worship? Are they meant to be pathways to another dimension of consciousness? Directions perhaps? The interpretation is wide open. We do know that the geometric designs decorating the walls of the Hypogeum are made with red ochre, a common hematite-iron pigment used in prehistoric times. I could not take my eyes off of these spirals and I was happy to find a hand-made sterling silver pendant with the same design on my way out. Neolithic spirals in Malta. Image © Wikimedia. While I would love to show you my own photographs of the Hypogeum, I don’t have any because photography is not permitted in the underground chamber. Most of the photos in this post are from Wikimedia and the Heritage Malta homepage. There is a packet of 8×10 prints available for purchase in the gift shop that is well-worth the price. While the temptation to take unauthorized photographs was great, this was one place that I did not want to get thrown out of. If you visit Malta and want to tour the Hypogeum, make sure you book your ticket well in advance. Only 80 people are allowed in each day, 10 at a time. I went in the middle of January and made reservations the month before. Everything you need to book your ticket can be found on the Heritage Malta Website. The site is closing for an unspecified period of time on April 4th, 2016, to install an environmental control system. Children under 6 are not allowed, and if you have issues with high humidity or tight spaces, this could be a challenging tour for you. My travel photos from Malta and Gozo Island. Heritage Malta’s Photographs of the Hypogeum. Jen is an army veteran, archaeologist, photographer, historian, history teacher, yogi, elephant lover, cat lover, and more. She created the Jaunting Jen blog to share her love of history, archaeology, and travel. Jen holds a BA in history, and isn't far from finishing her MA in ancient & classical history.